Where was Mom on Monday? 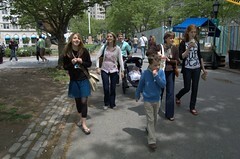 Strolling the streets of New York with a husband, four kids, a son in law, and a granddaughter. But don’t worry, the next installment of “Not Slanderers” will be here soon! Really fun times. Really. And now we’re home — finished celebrating two sons birthdays (Jamie, 22 on the 10th; Merrick, 9 today.) Bed for this lady is looking really good right now!